Able Move, a start-up company that has developed a portable sling for disabled travellers, has won the Stelios Award for Disabled Entrepreneurs 2018.
easyjet Founder Sir Stelios Haji-Ioannou awarded Able Move’s founder, Josh Wintersgill, with a £30,000 prize at a ceremony in London. Josh said he created the “Able-Move” sling so people with mobility issues can be transferred safely, comfortably and with dignity to and from aeroplane seats. The Founder, who has Spinal Muscular Atrophy, says he faces many physical challenges himself, but is determined to help disabled people overcome the difficulties associated with travel. The Stelios Award for Disabled Entrepreneurs, jointly run by the Stelios Philanthropic Foundation and Leonard Cheshire, started 12 years ago and recognises the achievements of disabled entrepreneurs in the UK. Sir Stelios commented: “I am delighted for Josh and Ablemove being the overall winner this year. 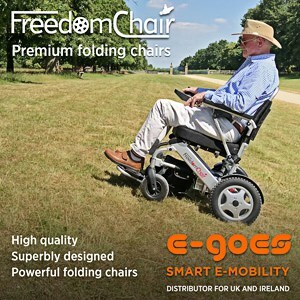 I think his invention can help many people travel with more dignity and comfort. Applications for the Award came from a diverse mix of sectors, including fashion, retail, sport and leisure and tourism. According to the Stelios Awards, a record number of candidates applied this year, up 12.5 percent from last year. Past winners have come from the travel agency, building and IT sectors as well as businesses specialising in disability and mobility aids and services.